The first domestically produced unmanned aerial vehicle (UAV), Bayraktar TB2, has been armed, making Turkey the fifth country to arm a UAV. 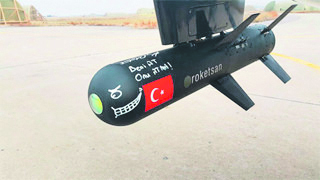 With the anti-tank missile installed, which was developed by Roketsan (a major Turkish weapons manufacturer and defense contractor based in the central Anatolian province of Ankara), Bayraktar successfully completed the test shots on Thursday. The Turkish defense industry sees the arming of the UAV as an important achievement, signaling its technological advancement. Bayraktar TB2, which has been readied for arming for over a year, entered the inventory of the Turkish Armed Forces (TAF) as the first national UAV. Bayraktar TB2's missile hit the 2x2 target in the test, which was carried out on Thursday. The ammunition in the Bayraktar TB2 was the long-range anti-tank (UMTAS) artillery, which was developed by Roketsan. Additionally, the missile developed by Roketsan was primarily produced for the ATAK T-129 helicopter with the fire-and-forget system and can be launched from the UAV, a helicopter or a plane. Countries like Azerbaijan and Pakistan also have interest in the missile. The fully domestically produced UAV has been carrying out test flights with the UMTAS missile loaded on it. On Thursday, two missiles, each weighing 37.5 kilograms, were installed on each wing of the plane. For the national UAV, which took off at 12 p.m. on Thursday, a small target panel was placed on the flight area. The laser-guided missile, Bayraktar TB2, which was launched at 2:30 p.m., hit the target 8 kilometers away from a height of around 16,000 feet with 100 percent success. Haluk Bayraktar, the chairman of Baykar Makina, the producer of Bayraktar TB2 (in collaboration with Kale-Baykar), said, "We saw how wise it was to develop a national and innovative model for the defense industry through the successful result we obtained. "The TAF and the undersecretariat of the defense industry have made very important contributions [to this project]. The success achieved in the first shot proves the proficiency of the Turkish engineers in their field." Furthermore, this development allows Turkey to not rely on foreign countries for its defense technologies. In 2008, Turkey wanted to purchase an armed UAV produced by the U.S.; however, the U.S. senate did not approve the purchase. Despite efforts from both Necdet Özel, the commander of the TAF, and Recep Tayyip Erdoğan, then prime minister, Turkey failed to secure the UVA. Lately, the U.S. armed two predators in the İncirlik Air Base located in the southern province of Adana and used them against the DAESH targets in Syria. It was believed that Turkey was going to purchase a UAV from either China or Israel. Turkey has become only the fifth country to produce its own UAV, following the U.S., China, Israel and Iran. The most well-known operational systems in the world among armed UAVs are the Predators and Reapers produced by the U.S. Also, Israel produces an armed UAV named Hermes while China produces a UAV called CH-3 and Iran has been producing the Shahed 129 UAV and exports the UAV to Sudan, Iraq, Lebanon, Venezuela and Syria. Meanwhile, the domestically engineered UAV, the Bayraktar, produced in a joint venture between the Kale Group and Baykar Makina, successfully completed its first full automatic flight at the Keşan Military Airport in the middle of 2014. Blazing a trail in the history of the Turkish Republic, the mini UAV's electronics, software and infrastructure were produced by Turkish engineers. The vehicle has a 12-meter wingspan and a 650-kilogram takeoff weight. It was reported to have software and flight systems superior to that of the Israeli Heron UAV. In addition, Bayraktar TB2 broke a world record in its class with the test flights it carried out in June and August 2014 with an altitude of 27,000 feet and 24-hour and 34-minute endurance.